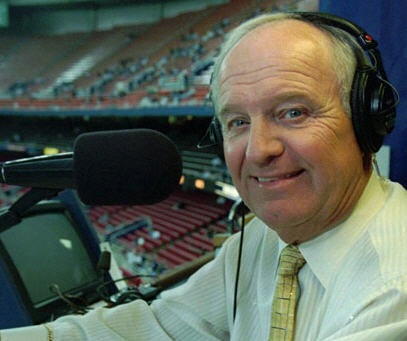 SEATTLE -- Hall of Fame announcer Dave Niehaus, the lead voice for the Seattle Mariners since their inception, died Wednesday, November 10, 2010. The 75-year-old, who was inducted into Cooperstown in 2008, reportedly died of a heart attack and was found by his wife, Marilyn, on the back deck of his Seattle home late on the kind of sunny Seattle afternoon that he loved. In addition to his wife, Niehaus is survived by his three children and six grandchildren. "This is a terrible loss," Mariners president Chuck Armstrong said. "He has been the link between the fans and the team since the club was founded." Niehaus, who started his career with the California Angels in 1969, moved north when the Mariners began play in 1977 and was widely credited with growing the Mariners' fan base during decades of losing before the team finally came into its own competitively in the 1990s. He was so much the epitome of the organization that when Seattle moved into Safeco Field after the All-Star break in 1999, Niehaus was chosen to throw out the first pitch. "We knew he was slowly winding down, but this is a real slap in the face," former Seattle outfielder Jay Buhner said. "We lost a family member. He was like another dad to me. "He was the consummate professional, and he was such a huge fan of the game. He loved baseball. He never wanted to take a day off. He always wanted to be out there." Niehaus had not been held back by his health in recent years, but in 1996, he had to go through two angioplasties, at which point he gave up smoking and altered his diet. "Dave has truly been the heart and soul of this franchise since its inception in 1977," Mariners CEO Howard Lincoln and Armstrong said jointly in a statement. "Since calling Diego Segui's first pitch strike on Opening Night in the Kingdome some 34 years ago, Dave's voice has been the constant with the franchise. "With the exception of his love for his wife, Marilyn, his children and grandchildren, there was nothing Dave liked more than the game of baseball and to be at the ballpark. He was the voice of spring and summer in the Northwest." With catchphrases like "My, oh my!" and his "Fly away!" call for home runs, Niehaus could describe a game in poetry and not just in prose, and he was one of the reasons the Mariners' radio broadcasts were such a Pacific Northwest staple. "I marveled at how at his age, every day at 2 p.m. he was at the ballpark and refused to miss a game," fellow Mariner broadcaster Dave Sims said. "He was that dedicated to the game. He was somebody you could talk baseball with, contemporary or old school -- whatever you wanted." Broadcasters around the country ranked Niehaus up there with the best. "I loved driving home from our games," ASA member and Rangers announcer Eric Nadel said Wednesday, "listening to him do the Mariners games from the West Coast on XM. He was a wonderful friend to me as well, really funny, and always willing to share his great wisdom." The summit of Niehaus' career was his 2008 Cooperstown induction into the Hall of Fame. "I'm glad he not only got into the Hall of Fame, but he got to enjoy it," former Seattle manager John McClaren, now a Nationals coach, said. "He was at the top of his game, and he got all those tributes, which he absolutely deserved." Simultaneously with Niehaus' passage to Cooperstown, the Mariners named the Safeco Field broadcast facility in Niehaus' honor. "He got a chance to go to work every day in a facility named for him," Sims said. "That had to be great for him." Buhner, who has done some radio and TV work for the Mariners, said it's hard to imagine doing a game without Niehaus close at hand. "No one will be able to replace him," Buhner said. "Oh, my god, it will be tough the first time to announce a game without him."